Dr. Mithun C Mohan graduated from Calicut Medical College, India and completed his postgraduate training in Internal Medicine from Pariyaram Medical College; under National Board of Examinations, New Delhi, India. Later he qualified for the MRCP from the renowned Royal Colleges of Physicians, UK and was awarded Membership in Royal College of Physicians and Surgeons, Glasgow (MRCPS). He also was awarded Memberships from National Academy of Medical Sciences (New Delhi, India) and International Medical Sciences Academy. 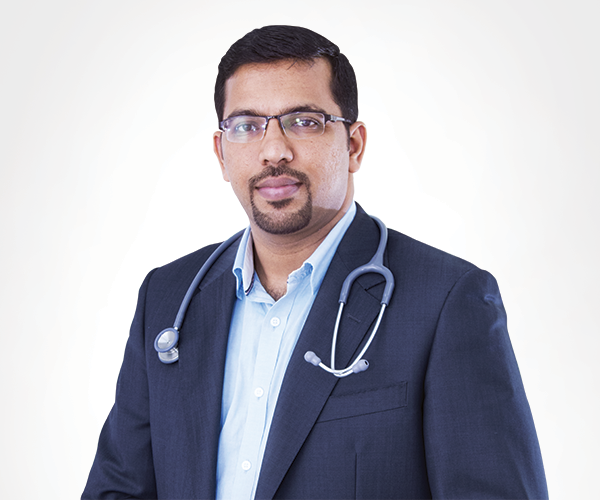 He is experienced in Pain management working with WHO in Institute of Palliative Care following which he was associated with Clinical teaching and patient care in Department of Internal Medicine and Critical Care, MES Medical College, Kerala, India; as Assistant Professor and Consultant Physician. With his vast clinical experience, he is renowned for diagnostic medicine and dealing with complicated cases at the same time as an academician with numerous publications in National and International medical journals. He was a speaker for many International conferences on various topics. His clinical skills include diagnosing and managing various multi-system diseases and with a special interest in Diabetes, Hypertension, Thyroid diseases, Infective diseases, Connective tissue and rheumatological diseases.